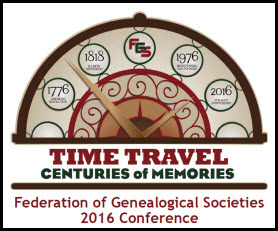 So this is FGS week and The Legal Genealogist is now officially en route to the 40th annual conference of the Federation of Genealogical Societies in Springfield, Illinois. The conference begins tomorrow, with a full day of lectures and presentations geared for those amazing people who keep the lights on and the wheels turning in all of the genealogical societies that you and I belong to and gain from. The presentations range from training for newly-elected society leaders who need to grab the reins and move forward quickly into their new responsibilities to records access issues to navigatinbg the waters of multigenerational societies to the best and highest use of technology and social media. The full general conference gets underway on Thursday, with a triple threat keynote — “Genealogy Past, Present & Future,” presented by CeCe Moore, Mary M. Tedesco and J. Mark Lowe. That one alone should be worth the price of admission. One of the real joys of attending a national conference is that there’s something for everyone. And for those who are — or should be — interested in genetic genealogy and figuring out how to integrate DNA evidence into our genealogical work, there’s a lot being offered. And remember what I said yesterday: just because you’re tied to a job or housebound or have kids in school doesn’t mean you have to miss all the fun. There are recordings of some or all of the sessions from these conferences and events. I’ll have more on how to get in on that part of the conference later in the week.